Hong Kong Pro-Democracy Leaders Released On Bail : The Two-Way Joshua Wong and Nathan Law, who led the 2014 Occupy Central protests against Beijing's leadership of the territory, were freed by Hong Kong's highest court pending appeal. 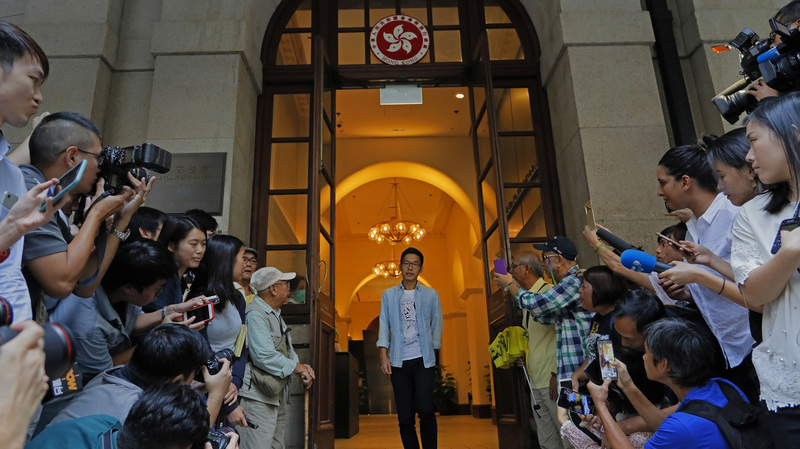 Pro-democracy activist Nathan Law (center) walks out from the Court of Final Appeal in Hong Kong on Tuesday. Hong Kong's highest court has released on bail two leaders of the 2014 pro-democracy demonstrations against Beijing's rule over the territory. Hong Kong's Final Court of Appeals freed Joshua Wong and Nathan Law pending appeal of their cases. "The two ... leaders were convicted alongside former student union leader Alex Chow Yong-kang, 27, over their roles at a protest that led to a 79-day occupation of major roads across Hong Kong in 2014, during which protesters demanded greater democracy. All three completed the non-custodial sentences handed down last year by a magistrate. But in August, after a review sought by the government, the Court of Appeal found those terms manifestly inadequate and gave them jail time instead. The trio are appealing against their new sentences and an application for a hearing for leave to appeal has been set for November 7." As The New York Times reported in April: "Mr. Wong and Mr. Chow were found guilty last year of unlawful assembly, while Mr. Law was found guilty of inciting people to take part in the assembly." Wong and Law were required to post 50,000 Hong Kong dollars ($6,400) for bail, surrender their passports and travel documents and report to police once a week, the Post reports. The Associated Press notes: "The decision to release Wong, the city's most famous activist, and Law, a disqualified lawmaker, coincidentally came the same day China's Communist Party was ending a twice-a-decade party congress in Beijing that expanded President Xi Jinping's power. There appeared to be no link, though the two events highlighted the widening rift between mainland China and semiautonomous Hong Kong."